NORWALK, CT (January 16, 2019) - JCK Las Vegas announces its continued partnership with the Palm Beach Show Group to expand the Antique & Estate jewelry and watch offerings on the world-renowned JCK Las Vegas show floor in 2019. The Antique & Estate Neighborhood will be located on Level 1 of the JCK Las Vegas show floor within the Sands Expo and Convention Center as part of the 2019 JCK Las Vegas Show, Friday, May 31 - Sunday, June 3, 2019. This valuable partnership is dedicated to enhancing the presence of antique and estate jewelry, pre-owned watches and select contemporary pieces to JCK’s already expansive show floor offering. The Antique & Estate Neighborhood represents the finest vintage jewelry and watch dealers from around the world. Their one-of-a-kind heirloom pieces offer a unique shopping experience for buyers and exhibitors alike. Participating vendors from around the world are vetted by the Palm Beach Show Group and JCK to ensure the quality of each dealer-selling only original pieces, no reproductions. Interested in exhibiting? 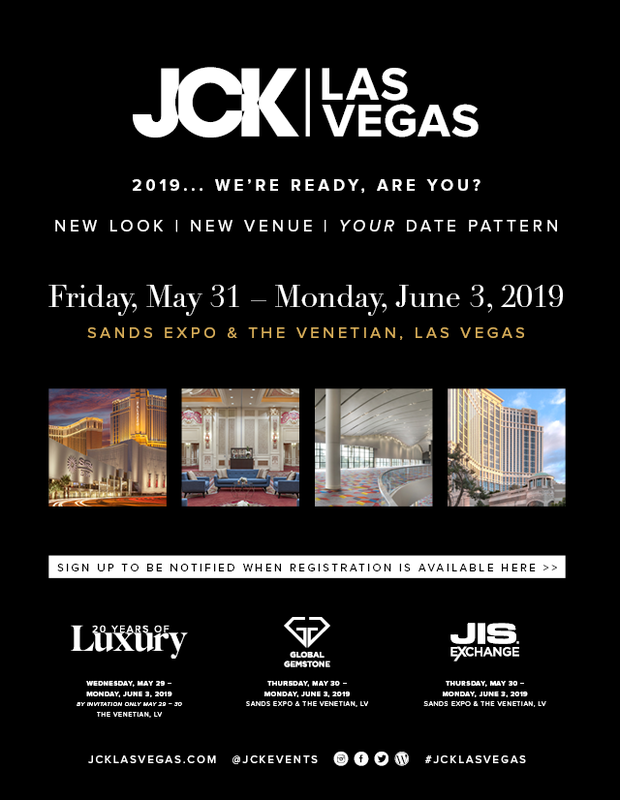 Visit jcklasvegas2019.com/exhibit. Interested in the Antique & Estate Neighborhood? Visit lasvegasjewelrywatch.com. For visitor pre-registration, visit jcklasvegas2019.com/pre-register. Palm Beach Show Group is the leading full-service show production company in the world, specializing in fine art, antique and jewelry shows. The Palm Beach Show Group produces high-end events that create unique meeting places for collectors, art advisors, museum curators, interior designers and dealers. JCK is a trusted partner connecting jewelry retailers and manufacturers/suppliers with trends, news, products, education and partners to build business. Whether attending face-to-face events, building inventory with online and onsite sourcing or obtaining authoritative news and insights from JCK Magazine — the leading industry publication in print and online — JCK offers a suite of tools and events to deliver sound solutions, innovative opportunities and essential information. For more information on JCK Events, visit jckonline.com.